A badly burned body was found in Southern California Thursday, as fire crews stepped up their assault on the worst of the wildfires raging across San Diego County. Firefighters located the body in a transient encampment in the area of Ambrosia and Calliandra, Carlsbad city officials said in a statement. The identity of the deceased individual was not released. Officials said there have been no reported injuries from the fire in the area. Later Thursday, city officials also lifted the evacuation order in Carlsband allowing residents to return home and see the devastation first-hand. The flames in that area have destroyed 18 condos, four single-family homes and two commercial properties. Elsewhere, fire crews dropped water from the air in an effort to beat back flames ravaging the San Marcos hillside. The fire in the city grew from 600 acres of brush area to 800 acres overnight, presenting the most challenging and unstable battle for firefighters in the region, where nine separate blazes began burning Tuesday. "It's day three and it's a better day than day one and day two, but we're not out of the woods yet," said County Supervisor Diane Jacob. She added, "This is just the beginning of what could become a very dangerous fire season — the worst fire season seen in a long, long time." Military helicopters and planes were being deployed to drop water and retardant. Explosions could be heard in the area as burning trees and vehicles added further fuel to the unabated fire. Calmer winds are expected to benefit crews on the ground as worries mount that the flames could reach homes. “The grass out there is nothing but kindling,” San Diego County Sheriff Bill Gore said of the volatile conditions. Residents in threatened parts of the city were still barred from returning to their homes. "Please evacuate," Gore urged residents at an afternoon press conference. "There will be no vandalism. We want you to return safely and not get hurt in these fires." On Wednesday, intense heat and dry winds whipped the various fires and scorched more than 9,000 acres across 14 square miles. About 21,000 homes were evacuated. At least 400 acres have burned in the city of Carlsbad, although the blaze there is about 60 percent contained, fire officials said early Thursday. Carlsbad Fire Chief Michael Davis said firefighters are still trying to eradicate hot spots. Temperatures are expected to soar into the triple digits in some places. “I would put all of that fire in a precarious situation,” said Davis, warning drivers to stay off the roads even though evacuation orders in some areas of Carlsbad have been lifted. Authorities said Thursday that the fires will be considered suspicious until a cause is established. “Certainly if it’s of a criminal nature, we will persevere with prosecution of the appropriate parties,” Carlsbad Police Chief Gary Morrison told reporters. Later Thursday, Escondido Police Chief Craig Carter said that officers received a tip about a "suspicious-looking individual" in the area of one of the fires, but after detaining and questioning the person they determined he was not involved and released him. The chief said he had "no reason to believe it is arson" but added it was "way too early to speculate." Meanwhile, police late Thursday arrested two people in connection with a brush fire that burned vegetation at a park in Escondido before being extinguished. 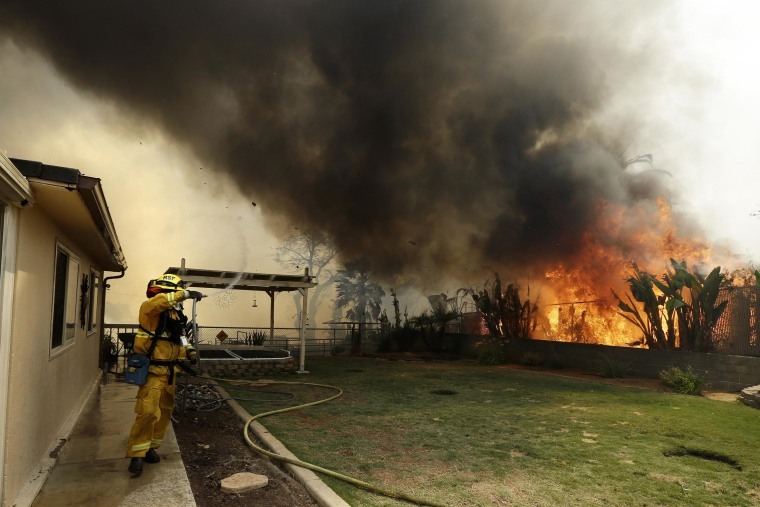 Police, who described the suspects only as being an adult and a juvenile, could not say if the pair were involved with any of the fires wreaking havoc across the county, according to NBC San Diego. Elsewhere in the county, a highway-area wildfire in Fallbrook that burned about 600 acres was basically fully contained, officials said. Another blaze in the northeast section of Camp Pendleton had burned more than 6,000 acres and was about 20 percent contained early Thursday. An evacuation order for base housing was lifted at about 1:15 p.m. (4:15 p.m. ET). Officials are still tallying the damage to homes, while schools across San Diego County remain closed for a second day. “I’ve never seen anything like this in 20 years,” said Bill Horn, the county supervisor. Some homeowners tried to protect their property by hosing it down, but it was a losing battle. Closer to Los Angeles, a fire burning in Anaheim closed both directions of the 91 Freeway on Wednesday afternoon. Another blaze in Long Beach threatened a hotel used in Hollywood productions, according to NBC Los Angeles. Embers from a collection of brush fires along the Pacific Coast Highway blew a few blocks away to the SeaPort Marina Hotel, Long Beach fire spokesman Jim Nash told the station.